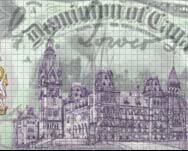 The full images of bank notes appearing throughout this website were created by Brent W.J. Mackie in accordance with the Criminal Code of Canada as stated elsewhere in this website. © 2002-2006 Brent W.J. Mackie. The remainder of this website has been designed and created by Brent W.J. Mackie. Unless otherwise stated, all work is his own and is his property. © 2002-2006 Brent W.J. Mackie.